On September 18th, Alibaba is expected to complete its IPO process and officially become a listed company on the New York Stock Exchange. If the company’s stock price remains in its expected range by the time it is listed, the IPO is expected to raise approximately $21 billion; the largest in US history following Visa’s $19.6 billion IPO in 2008. Before I proceed to discuss the IPO, there may be those of you who have never heard of Alibaba before and think that I’m talking about a Middle Eastern restaurant. No, Alibaba isn’t raising $21 billion to open up a new shwarma stand so let me start off by explaining what Alibaba is. 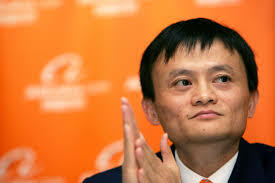 Alibaba is a Chinese e-commerce firm that was founded in 1999 by Jack Ma, who was previously an English teacher. Similar to Amazon, Alibaba operates a business-to-consumer retail website named Tmall where established companies sell directly to customers. Additionally, Alibaba also runs a website called Taobao.com, which is a consumer-to-consumer e-commerce site where individuals and small businesses sell goods to one another. Finally, Alibaba offers an electronic payment system called Alipay, just like Ebay’s Paypal. Thus, Alibaba is somewhat of a combination of Amazon and Ebay. The biggest difference between Alibaba and Amazon is that whereas Amazon facilitates the sale of merchandise between companies and consumers by handling the shipping, Alibaba merely brings the two parties together in an online marketplace. So it doesn’t ship anything. Amazon’s main source of revenue is the commission it charges to companies on every transaction completed through its website. However, Alibaba does not charge any commissions on Taobao. Instead, it charges sellers to advertise on the website in order to stand out among the millions of other sellers on the website and increase their chances of selling their product. Since its founding, Alibaba has been growing at a rapid pace and has gained control of 80% of the Chinese e-commerce sector. Currently, the company is extremely profitable and nearly unchallenged in its hegemony in China. In the 3 months ended June, the company’s net income increased to $1.1 billion, 42% more than the net incomes of Amazon and Ebay combined. To look at a statistic further up the income statement, Alibaba’s EBITDA margin in the latest quarter was 54% compared to Ebay’s 26.7% and Amazon’s meager 5.7% Currently, the company is owned by Jack Ma, Joe Tsai, who is the vice president of Alibaba, and various other investors including Yahoo who made a very profitable investment in the company by purchasing a 40% stake back in 2005 for only $1 billion. Here is a short video by the New York Times that gives some more information on the company. Besides efficient management and a determined vision, Alibaba’s success can be traced to two important factors present in the Chinese economy. First off is the rise of the Chinese middle class. While Chinese income per capita may still be lower than other developed economies due to its large rural population, it can’t be denied that the Chinese are getting richer. As the graph below shows, disposable income has been growing at a steady pace in line with the nation’s economic growth. In January of this year, disposable income rose 9.7% on an annual basis and reached 26,955 yuan. Thats about $4400. Yes you’ve probably heard stories and read on this blog that the growth in Chinese economy has been slowing down when compared to its past pace. However, incomes in China continue to rise and the middle class continues to mature. That means that the Chinese are willing to spend more, especially on higher quality retail goods that can be found on Alibaba. The rise of the middle class in China also means that internet usage is increasing rapidly, something that is vital to Alibaba’s business. As more of China’s 1.3 billion population gain access to the internet, the more that Alibaba’s revenues are likely to increase. 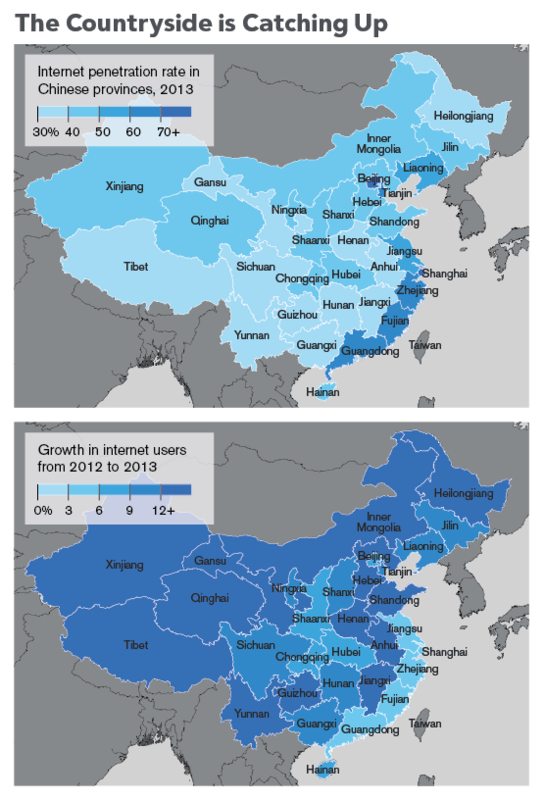 Here’s an infograph provided by the China Information Network Center that depicts the increase in internet usage across China. As you can see, although internet usage is frequent in China’s large coastal cities, it is rapidly spreading to the Chinese countryside. With a consumer base that is already unmatched in size, Alibaba can expect to be even more profitable as more people in China gain access to the internet. The other reason why Alibaba and e-commerce has been so successful in China is because of the lack in the physical retail market. Despite being greatly populous, China’s less developed cities do not have the large shopping malls and well known brands that larger cities such as Beijing has. This is where Alibaba steps in. The company creates a bridge between the hundreds of millions of Chinese who want to spend their money but want to purchase something other than cheap replaceable products. As the video stated, Alibaba is set to be valued at approximately $167 billion if it is listed at the expected share price between $60-65. 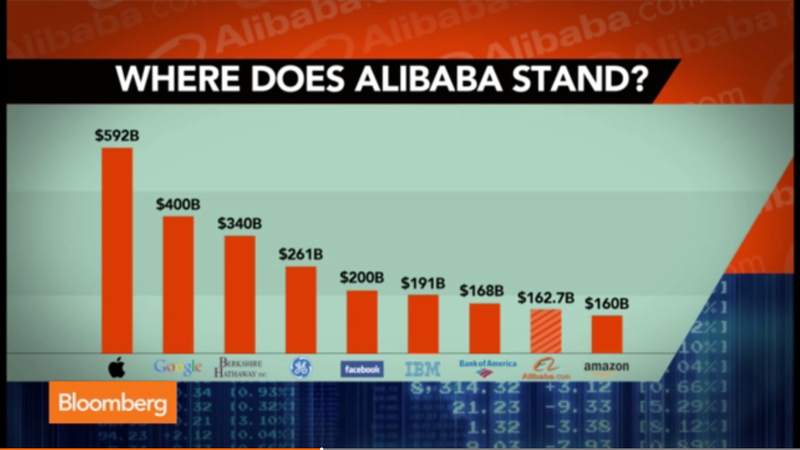 Here is a graph provided by Bloomberg that compares the expected IPO valuation of Alibaba to other tech companies. Although $162.7 billion is a lot of money, analyst actually believe that Alibaba is set undervalued and set to enter the market at a discount. Market capitalization (a means of measuring the market value of a company) is calculated as share price multiplied by the number of shares outstanding. Thus, it can change as soon as the company becomes public and starts to trade. However, experts had expected Alibaba to enter with a market value closer to $180 billion. The reason why Alibaba wishes to enter the market at a relatively undervalued price is because Jack Ma wants to avoid the Facebook pitfall. 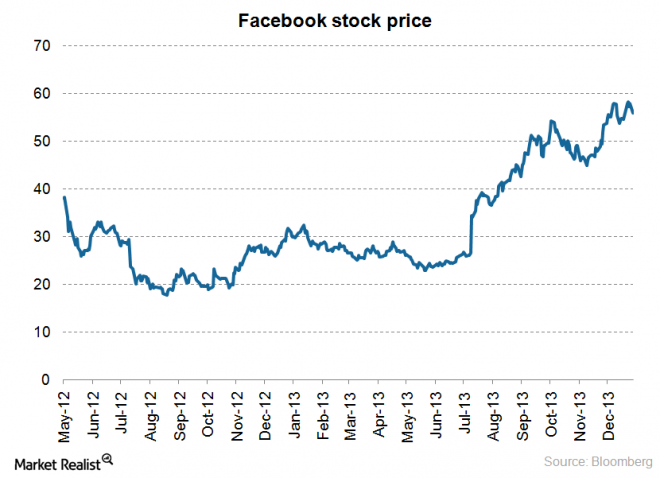 Facebook was valued at $200 billion at the time of its IPO. This was an overvalued price for the company as its price plummeted after the IPO and didn’t reach its IPO price until a year later. So should you buy into Alibaba as soon as it hits the stock markets? Is it worth committing your retirement money into an e-commerce company run by the Chinese Steve Jobs? As successful as Alibaba is and is set to be, I maintain the same opinion about IPOs as I did at the time of Twitter’s IPO. While you can check out the video below that explains why Alibaba would make a great investment, it is wise to stay weary of IPOs for the first few months. That is because generally, many institutional investors and preferred shareholders make deals with companies to hold their stock for a certain period of time following the IPO. After that period passes by, many of them dump their shares, lowering the price of the stock. So, as you listen to the following video about why Alibaba is a great buy, I recommend that you give the stock time to find itself in the market. If the fundamentals of the company are strong, you can still make a buck off of it if for the next several years even if you enter a couple months late. You can’t deny that things are just not working out for Argentina these days. First, they had their hopes and dreams crushed earlier this summer after they lost against Germany in the World Cup. Obviously, soccer is just a sport. However, its also a way of life in most South American countries. So you can imagine how heartbreaking it must have been for the Argentinians. To add insult to injury, recently, Argentina also defaulted on part of its sovereign debt. This means that it failed to meet its payment obligation to some of its creditors. Before we continue let me clear up two common misconceptions about sovereign defaults. The first one, is that it occurs when a country goes bankrupt. This is false. Default just refers to not being capable of paying or refusing to pay debt. The fact that Argentina defaulted on its debt was entirely its own decision as I will explain soon. Argentina still had money in its treasury to pay its debt off. Or it could have printed some money to do so; but it refused. The second misconception is that sovereign defaults are very rare occasions that only occur once in a million years when the economy or financial sector of a country is in shambles. This is partly true. Yes, financially troubled countries are more likely to default, but even developed countries can default too. The United States came close to defaulting in 2011 when Congress nearly refused to raise the country’s debt ceiling. 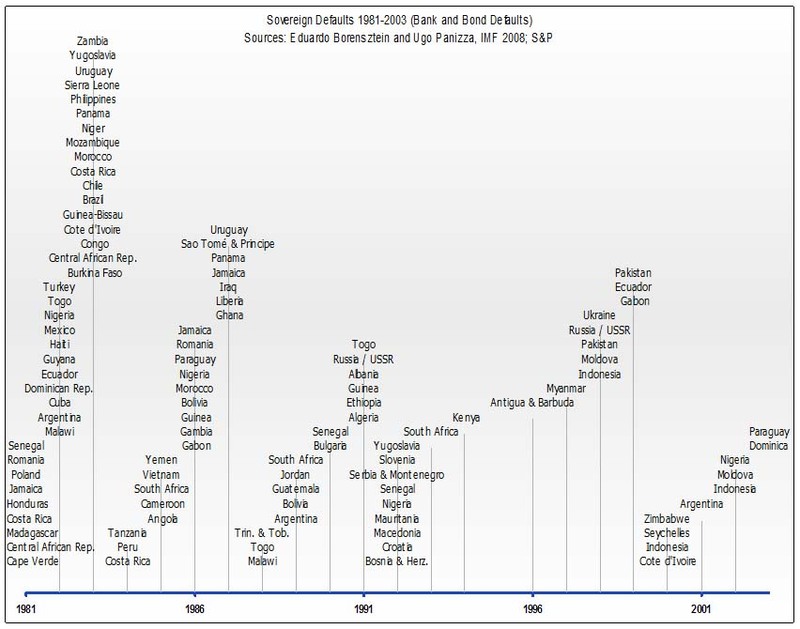 The following list of sovereign defaults since 1961 shows that it can happen pretty often. So why did Argentina default? You might have noticed from the table above that Argentina defaulted not too long ago in 2001. The story of Argentina’s most recent default can be actually be traced to its previous one. So lets go back to 1998 to get a better understanding of where we are today. In order to control the hyperinflation caused by an economic crisis in the late 1980s, Argentina decided to peg its currency, the austral, against the US dollar in 1991. This lowered inflation and caused Argentina’s GDP to grow by nearly 50% between 1990 and 1998. Living standards rose and Argentina was labeled as one of the new emerging economies. However, not everything was as it seemed. Deep down within Argentina’s economy, a crisis was brewing. Argentina was spending a lot more than the revenue it was generating. Thus, the nation’s external debt kept on piling up. A financial crisis that occurred in 1997 in Asia slowed the Argentinian economy and reduced investor confidence in emerging markets such as Argentina. The final piece of the puzzle came when in 1999, Brazil devalued its own currency, causing the Argentinian austral to be less competitive against the currency of its neighbor. After having enjoyed a honeymoon period during the early 90s, Argentina’s GDP declined by 3% in 1999 and the country entered a three-year long recession. Despite consecutive tax hikes and spending cuts by the Argentinian government, unemployment kept rising, the economy kept on shrinking and borrowing costs rose, making it harder for the the nation to finance its debt. The situation failed to improve as the people took the streets to protest and the IMF refused to keep lending to Argentina. By November of 2001, investors rushed to sell their australs, causing a run on Argentinian banks. Shortly thereafter, Argentina was forced to abandon the currency peg. Finally, on the last week of 2001, the Argentinian government defaulted on $132 billion of public debt. Here are a couple graphs that display how everything went insane in Argentina around 2000. This is where our story truly begins. Until that date, Argentina’s $132 default was the largest in history. Despite cutting off the country from international capital markets, it stopped the Argentinian currency from entering hyperinflation and as the graph depicting Argentina’s GDP growth rate proves, it helped the country to enter a period of growth. Argentinians are known for their kindness. That’s one of the reasons why their flag has a smiling sun on it. So, in 2005 and 2010, the Argentinian government offered new discount bonds to the holders of its defaulted debt. These bonds pad about 35 cents on the dollar of the original bonds. It was an offer that these investors could not refuse. If they did refuse, they got nothing. They had worthless bonds in their hands. If they said yes, they at least had something. Thus, 93 percent of bondholders agreed to the deal. Who were the the remaining 7 percent, and what where they thinking? Well, they’re a group of hedge funds including Elliott Management and Aurelius Capital and they decided to take off their investor hats and become lawyers by going on a crusade to get the exact amount of money that they were originally owed. In other words, this was their reaction to Argentina’s proposal. You see, the original bonds had a clause called parri passu, which means ‘equal treatment’ across all bonds. The holdout investors claimed that this meant that Argentina can’t pay back some bond holders and not the rest. Its a clever argument really. And its also risky. These investors could have taken the easy way out and received the discount bonds. But for years they’ve been going after Argentina to get their money back in its entirety. Its something that only a very determined and diabolical person would do. 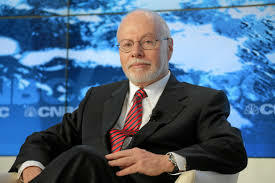 Paul Singer, the CEO of Elliott Management, the most aggressive hedge fund, fits that persona both characteristically and physically. I mean just look at him. He is a prime candidate to be the next Bond villain. So how have these hedge funds fared over the past decade? Not so successful actually. They attempted to sue Argentina in the past and failed. When it seemed that suing wasn’t working, they turned to seizing Argentinian assets. Not financial assets though, they targeted physical assets. In 2012, Elliott Management seized a frigate belonging to the Argentinian navy off the coast of Ghana as partial payment for the money that it was owed. But this tactic failed as well when Elliott Management were forced to hand the frigate back. 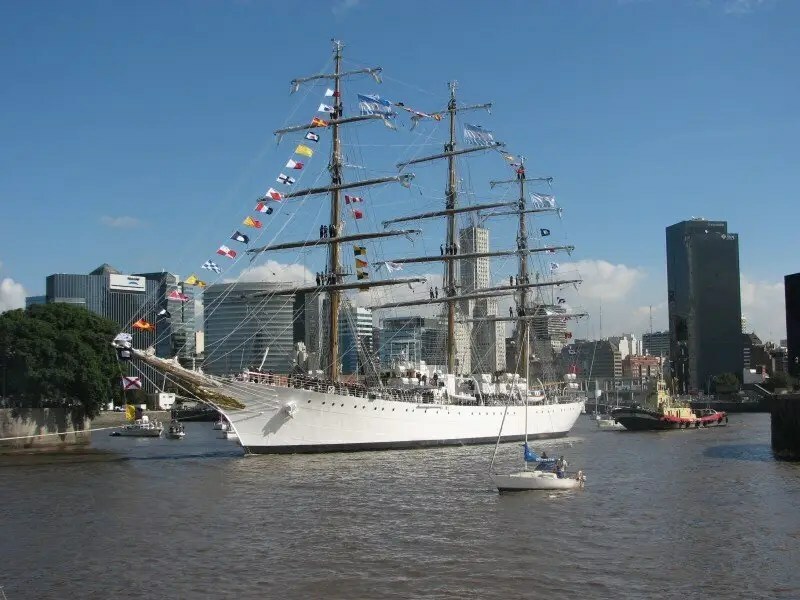 I don’t know what is funnier, imagining hedge fund pirates taking over a ship in Armani suits, or that the fact that this ship is still used as a frigate in the Argentinian navy when it clearly belongs in a museum. The holdouts made their breakthrough in 2012 when a lone judge in New York named Thomas Griesa ruled that the holdouts were correct about the parri passu clause, and that Argentina couldn’t pay the exchanged bonds without paying the holdouts too. To put the pressure even more on Argentina, Judge Griesa ruled that if Argentina refused to pay the holdouts, it would prevent any financial institution from facilitating the payments Argentina maid to the exchanged bondholders. This decision put Argentina in a tough situation because if it didn’t pay the holdout bonds, it would default on all the exchanged bonds, even thought it was willing and able to make the payments. I’m sure this was Paul Singer’s reaction after Judge Griesa’s decision. Time went by, insults were thrown and meetings were held, but both sides could not come to an agreement by July 30, which was the deadline that Judge Griesa had placed on Argentina. Hence, Argentina defaulted. 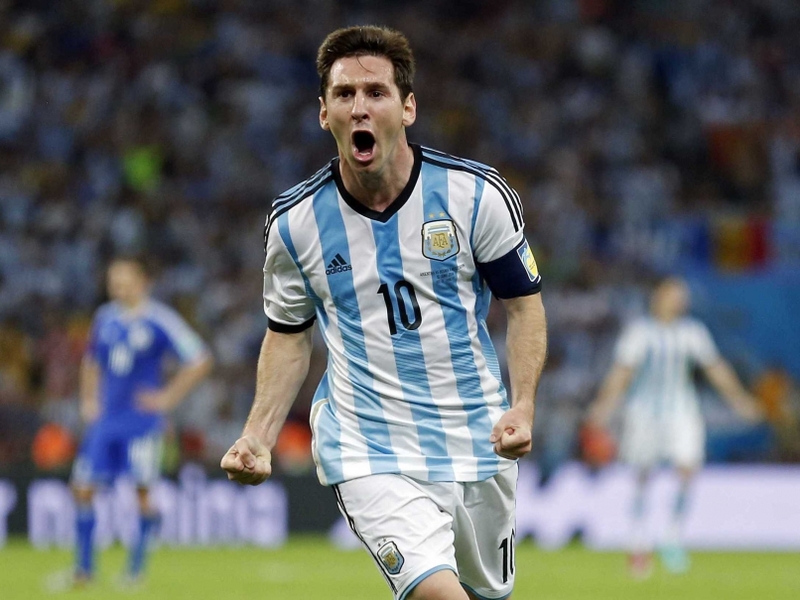 Besides stubbornness, there were several other reasons for why Argentina refused to pay. Firstly, their foreign currency reserves were running low. At the time of the default, Argentina only had $29 billion in foreign currency reserves. If they paid the holdout investors, then their reserves would reach critically low levels and would greatly effect their monetary policy in the future. The second reason is that Argentina had another clause in their exchange bonds called RUFO ( Rights Upon Future Offers). This clause forbid Argentina from offering any new future bondholders a better deal, without also extending the same deal to exchanged bondholders. In other words, they would have to pay the exchange bondholders the same full amount on each bond just as they would pay to the holdouts. If Argentina broke this clause, they would have been liable to pay the exchanged bondholders approximately $120 billion. Although the holdouts failed to get what they wanted, they are still searching for ways to shake some cash out of Argentina. On August 11th, a federal court in Las Vegas gave NML Capital, one of the holdout creditors, the right to investigate the US-based companies of an Argentinian businessman named Lazarao Baez. Mr. Baez is under investigation in Argentina for allegedly embezzling $65m from government contracts. By looking into Baez’s activities, NML hopes to perhaps recover some funds through a court order and to humiliate Argentina for not paying its debts. I think that after defaulting 8 times in its 200 year history, Argentina is impervious to financial humiliation. So what happens now? Will Argentina’s economy crash again like last time? Not really. This default occurred for obscure legal reasons as opposed to financial reasons. Of course it will continue to cut off Argentina from international capital markets, making it harder for Argentina to borrow, but they were still in that situation anyway. Argentina’s economy will continue to be in stagflation, with negative growth and high inflation. I think they’re used to it by now. Finally, because Argentina’s external debt and GDP is so low compared to the global economy, this default will not have a large effect on global markets. Nevertheless, I feel bad for the people of Argentina. They’re forced to suffer due to the mismanagement of an incompetent government and the greed of a group of rich hedge fund managers. I think there’s only one man who can solve this problem. The one man that all Argentinians turn to when they are desperate for something miraculous to save them at the last minute…Lionel Messi. BONUS: If you follow this blog regularly, you would know by now that I like to simplify complicated concepts by using humor and various real life examples. I think it gives a chance for people who are not familiar and not interested in these topics to understand and enjoy reading about these issues. Lets be honest, sovereign debt defaults, hedge funds and RUFO clauses are not the most interesting subjects in the world. As a bonus, I’ve added a video of Felix Salmon, a Reuters reporter, who tries to explain the story of Argentina’s default in even simpler ways than me …by using Legos and action figures. Enjoy. In 2011 and 2012, the Eurozone was on the brink of destruction. Investors were preparing for a Greek exit from the Eurozone and some experts were even questioning the very existence of the European Union. However, in two years, much has changed. Today, the possibility of Greece leaving the Eurozone or of Cyprus becoming insolvent seems like a distant memory and after two years of being in recession, the Euro area has finally generated positive growth. The growth is slow, but is nevertheless positive. How did the Eurozone manage this turnaround? Well, we can all thank the European Central Bank (ECB) for this. In July of 2012, ECB President Mario Draghi announced that the, “ECB would do whatever it takes to preserve the Euro.” In addition with this speech, the ECB extended the maturities on the loans it gave to European banks (called Long Term Refinancing Operations) and announced a new program (called Outright Monetary Transactions) where for the first time, it promised to purchase the sovereign bonds of financially troubled nations, given that they agree to implement certain fiscal reforms (tax hikes, spending cuts, etc.). The ECB used a tricky monetary maneuver called sterilization to make sure that LTRO didn’t increase the European money supply the way FED’s QE did and until today, no country in the Eurozone has actually applied for a bailout through Outright Monetary Transactions. However, the mere existence of these programs created a sense of security in the Eurozone and they helped reduce the sovereign bond yields of Eurozone nations that had been inflicted by the crisis. For you bond newbies, the lower the interest rate on a bond, the less riskier it is deemed by the market. 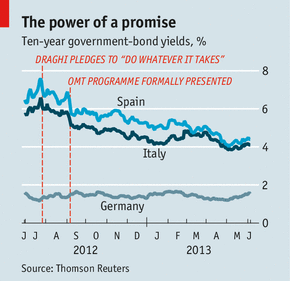 The graph below does a good job in visualizing Spanish and Italian bond yields in relation with ECB actions. In fact, one could argue that the sovereign bond yields of periphery Eurozone countries have dropped too low. For example, on the day that I have written this post, 10-year Spanish government bonds are yielding 2.68% whereas 10-year German bonds are yielding 1.27% . 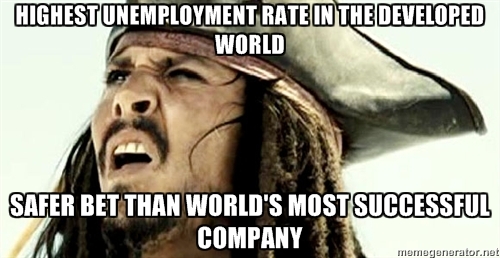 That means that the spread between the country with the highest unemployment rate in the developed world and the safest economy in the Eurozone is less than 2%. Back in August of 2012, that spread was about 6%. Even when Apple issued 10 year bonds in April of this year, their bonds yielded 3.45%. I think its safe to say that the markets have treated periphery Eurozone nations rather kindly. Despite the irregularities in the bond markets, its hard to deny that the Eurozone has been in a honeymoon period for the last two years. However I realized that something is rotten in the state of Denmark, France, Italy, Spain, and all the other Eurozone countries (that was a Shakespeare joke. Read a book people). when a couple of months ago, I got a phone call from my good friend Mario Draghi. Even though I had a very busy schedule, I couldn’t say no to one of my oldest friends. So I decided to take the trip down to Frankfurt. 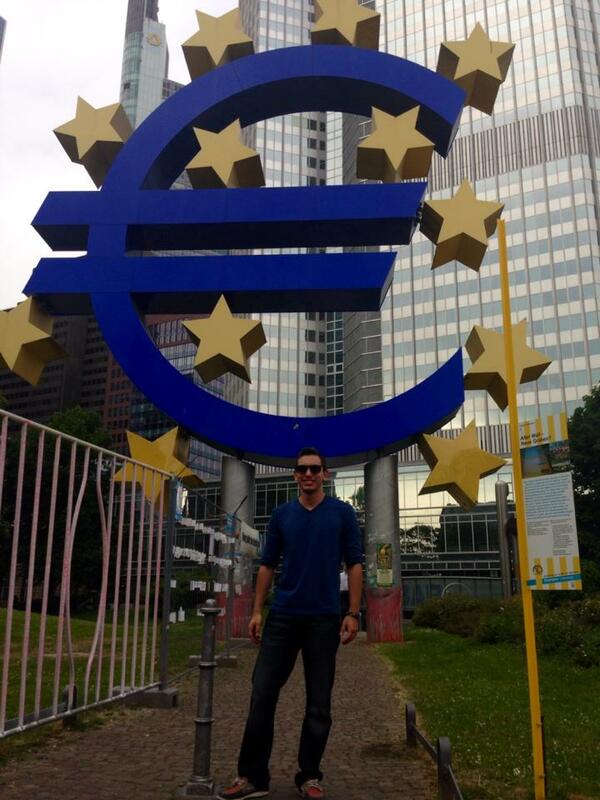 Here I am outside the ECB. I’ve lost count of how many times I’ve been there but I still have to go through security. Its so annoying. Anyway; when I walked into his office, Draghi seemed worried. He told me that the Eurozone is on the brink of negative inflation, otherwise know as deflation. The ECB’s target inflation rate has been 2% for the past several years. However, as the graph below shows, Euro area inflation has been below 1% since November of last year. In fact, just last month, several European countries including Greece, Cyprus and Hungary observed negative rates of inflation. Even those of us who haven’t received an education in economics have been told to fear inflation. However, deflation can be just as bad, if not worse. I’m pretty sure I explained this in a previous post but deflation has two main negative impacts. First of all, deflation discourages spending. Why should a sensible person purchase something today if he knows that it will be cheaper and more affordable tomorrow. This situation might seem profitable for an individual, but if everyone acts this way, then spending will decrease and the economy will come to a halt. Secondly, inflation has the ability to ease the cost of borrowing. Imagine that I take on a loan. Because of inflation, the amount of money I borrowed becomes less valuable. However, the amount that I borrowed stays the same. Thus, it becomes easier for me to pay back my loan. In cases of deflation when a currency gains in value, the exact opposite happens and debt becomes harder to pay off. Due to the austerity measures installed in many Eurozone countries following the debt crisis, the Eurozone economy is barely expanding. Draghi fears that deflation could push the Eurozone economy back into recession. One of the reasons that Draghi had his hands tied was because he had already lowered interest rates to nearly 0%. Yet, he was failing in spurring inflation. That was where I stepped in to give Draghi some advice. On June 5th, Draghi listened to everything I had to say and held a press conference. The cameraman zoomed in on Draghi so I didn’t make the shot but I was sitting right next to Draghi during the press conference. Secondly, in the final hours of our meeting, we came with an idea to initiate a new financing program called Targeted Long Term Refinancing Operations (TLTRO) where banks can borrow money from the ECB equivalent to as much as 7 percent of their outstanding loans to non-financial corporations and households. The loans will be given for 4 years. However, if these institutions don’t lend out the money they get from these loans, we will cut their maturities to two years. Finally, I told Draghi to always have an ace of spades in his back pocket, in case the worst comes to worst. That ace of spades, would be outright bond purchases, just like Quantitative Easing in the US. We came to the conclusion that its better to wait and see how the Eurozone economy reacts to the policies we came up with that day, but letting the markets now that just like back in 2012, we would do whatever it takes to spur inflation in the Eurozone will help increase inflation expectations. Those are the unorthodox policies that Draghi touched on towards the end of his speech. Bond yields are already very low and QE in the United States has shown that bond purchases don’t necessarily spur inflation. However, the idea of bond purchases being a possibility will definitely play a role in protecting the Euro from appreciating. After working for hours to come up with these policies, we finally called it a night and decided to go to Angela Merkel’s mansion in Berlin for a wild party. It was strictly BYOB. 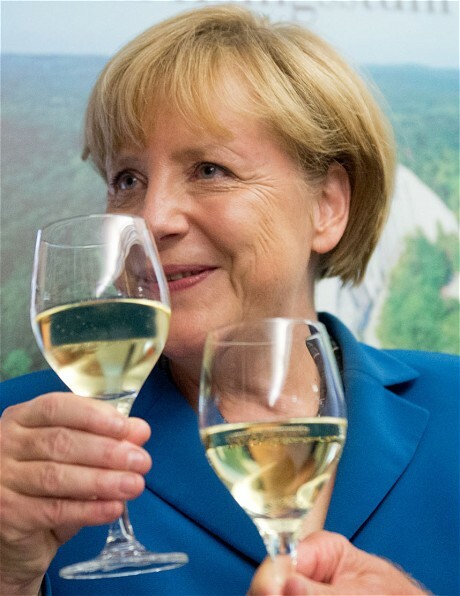 Apparently Merkel is tired of buying everyone drinks. All those bailouts in Southern Europe may be to blame. I can’t tell you what went down in that party. Lets just say that many world leaders wouldn’t want the pictures to leak to the press. This is only the pregame. Following Draghi’s press conference in June, Eurozone inflation remained stable at 0.5%. 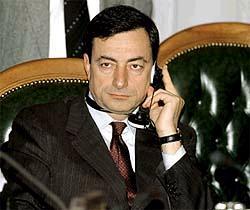 Draghi gave me a phone call last week and thanked me for his help. I told him that he owes me one and I gave him one final piece of advice. I told him to publish the minutes from the ECB meetings, just like the way the FED does them. This would not only give the ECB some much needed transparency but would also increase the effect that his decisions have on market expectations. As you can see, my friend Draghi looks awfully cute when he is happy. I hope his happiness continues and that the Eurozone can get out of this deflationary trend soon. In the globalized world that we live in, our economies are extremely interconnected. Thus, the fate of one large economy can have an effect on all of our countries and all of our lives. For sometime now, I’ve been aware that I could use the traffic on this blog to promote other causes besides informing my readers of contemporary issues. For example If I wanted to, I could try to raise money for a new guitar to start my musical career. However, instead of pursuing a personal goal, I’ve decided to raise awareness on how to help the victims of disasters from around the world. I initially did this in November for the typhoon that had struck the Philippines. Following the recent mining disaster in Turkey and the deadly floods in southeastern Europe, I was initially stricken with sadness and grief over the loss of so many lives. However, I soon became emboldened when I realized that in addition to contributing to aid efforts myself, I that could perhaps convince and help some of my readers to contribute as well. Rest assured that for each of the incidents I discuss, I will be very careful to provide accurate details regarding the events that have occurred and to make sure that the organizations that I list are legitimate. On 13 May, 2014, an explosion at a coal mine in the Turkish city of Soma caused an underground fire within the mine. In the ensuing days, even though 486 miners survived a total of 301 miners unfortunately lost their lives, making it the largest mining disaster in the history of Turkey. The Turkish Ministry of Energy stated that most miners died due to carbon monoxide poisoning. 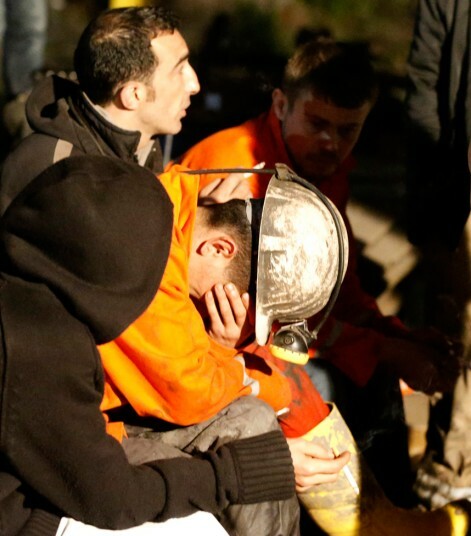 A Turkish miner weeps for his deceased colleagues. 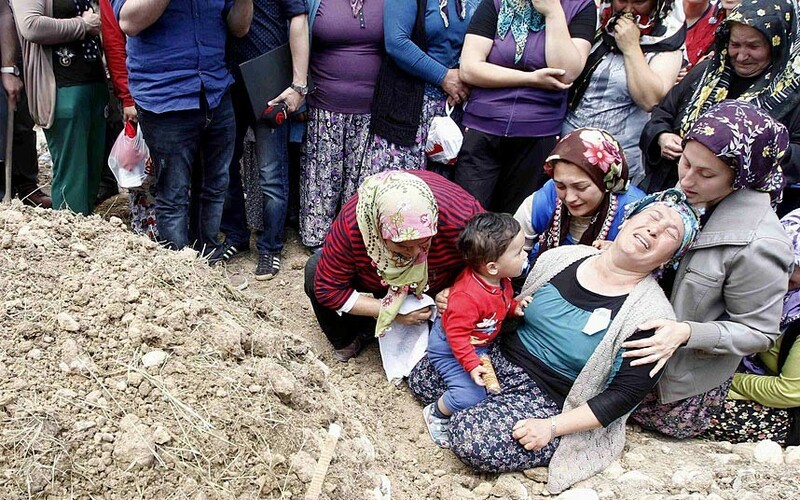 Women mourn at the graves of the miners. 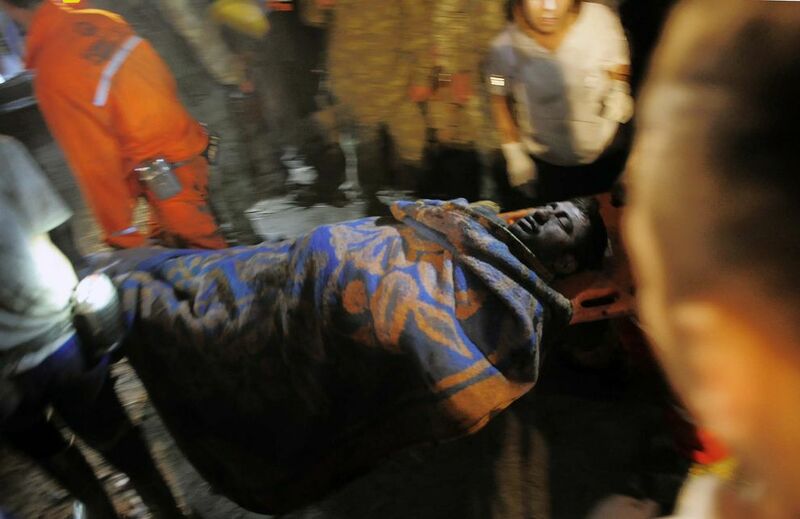 The body of a victim is carried away from the mine. In the Soma mining disaster, it wasn’t homes or buildings that were destroyed; it was families that were most severely stricken. A crumbled house in an earthquake can be rebuilt or restored. A lost father however, will never be brought back. Authorities have reported that 432 children have lost their fathers in the disaster. With this thought in mind, and in addition to the fact that the miners were low income blue collar workers, I have deemed it most useful to contribute to the Turkish Education Foundation’s TEV Soma Hope Fund. This fund is a scholarship that will give financial aid to the children of miners who were killed or injured in the mining disaster. The true tragedy of this incident is that so many miners perished for such a risky job for which they earn too little. Hopefully by contributing to this scholarship, we can make the life of the families of the victims just a little better by making it easier for them to provide education to their children, who have now been left without fathers and brothers. 3) Under the list of funds choose TEV Soma Umut Fonu and enter the amount you want to donate in the field below. 4) Enter your personal and credit card information. 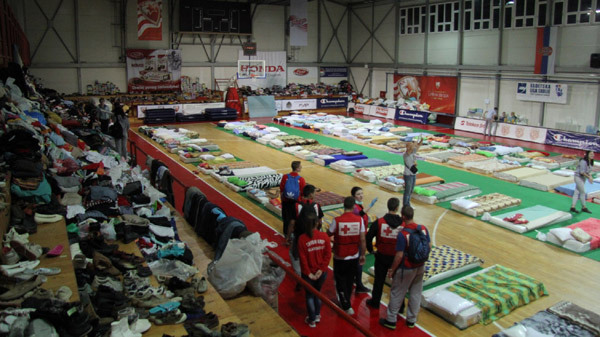 On May 15th, multiple floods centered in Serbia and Bosnia and Herzegovina struck large parts of southeastern Europe. By May 20th, 49 people were reported to be dead and by May 23rd, over 70 people are still missing. The monetary damages are also vast and have surpassed 1 billion euros. In total, over 1.5 million have been adversely effected by the floods. Coupled with the frequent landslides, these are the worst floods the region has witnessed in over 150 years. The situation is especially dire in Bosnia. Whereas Serbia and Croatia are members of the European Union and have access to the EU’s 500 million Euro Solidarity Fund, the Bosnian government did not even have a centralized disaster management system until the disaster struck. A local sports facility has been turned into a shelter. A Serbian man stands atop his home. 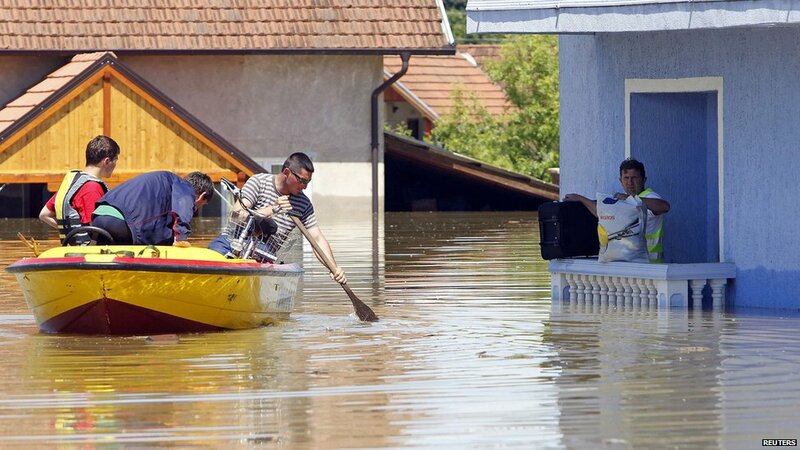 Bosnian citizens must now travel the streets of their hometown on boat. Right now, there is said to be a great shortage of wood, drinking water, clothes, hygenic products and medicine. Many hospitals, schools and houses will have to be rebuilt. Between 1992 and 1995 the region had been the site of a ethnically driven war. The emotional and physical scars of the war can still be felt in these countries. Some fear that lingering ethnic tensions might cause people to tamper with where aid is delivered to. I on the other hand, am optimistic that the disaster can bring fractured communities and ethnicities together. In the meanwhile, we can do our part to help the people of southeaster Europe by donating to the following organizations. As I stated before when raising awareness for the typhoon in the Philippines, you might not know any of the victims in Turkey or in southeastern Europe. You might not even have any friends that come from those nations. But no matter where we’re from, we all share the same emotions. We are all capable of love, grief, joy and sadness; no matter what our background, nationality or religion is. Thus, even if it will make just the slightest difference, we should make an effort to help one another no matter where we come from. A small donation may not have a significant impact on our lives, but it in a time of despair it could prove invaluable in helping a Turkish orphan to someday go to college or in aiding Serbian family to rebuild their home. On Friday May 16th, retired general Khalifa Haftar stormed the Libyan parliament and declared it dissolved. Libya was among the Arab countries where just three years ago, the people had risen up against the government to embrace democracy and overthrow their dictators who had ruled over their countries for several decades. Three years later, both in Libya and across the rest of the Middle East, dictators have fallen and the political landscape has greatly changed. However, none of the Arab countries have been able to peacefully and properly install a democratic government. The story in Libya revolves around the fact that the country has had a very strong tribal culture that traces its origins way before the toppling of Libyan dictator Muammar Gaddafi in 2011. Although Gaddafi was a brutal dictator, he had centralized power and had been able to keep the tribes in check during his reign. Following his ouster during the Libyan Civil War of 2011, a massive power vacuum appeared. Even though the opposition has attempted to form a legitimate and democratically elected government, fighting among the tribes, which had been kept under control during the Gaddafi era, have so far made the democratization process a failure. The transitional government currently has no control over a majority of the country, a constitution remains to be approved by a referendum and the country awaits the election of its fourth prime minister following the kidnapping and ouster of the country’s previous prime minister. Regarding the instance earlier this week, General Haftar has claimed that the current government, which is led by the Islamist Justice and Construction party, is too religious and has transformed the country into a breeding ground of Islamist terrorists. The central government dispatched its own loyal tribal militias to counter the retired General. Just like in Libya, internal turmoil rages in the remaining countries that had been part of the Arab Spring. A military coup overthrew the democratically elected government in Egypt, a bloody civil war still rages on in Syria and the uprising has been crushed in Bahrain. The video of this week takes a look in detail at how each country has fared in the past three years. The video is 4 months old, but not much has changed since then. It is saddening to see that much of the euphoric feelings at the start of the Arab Spring have now turned into disillusionment and outright tragedy. It goes to show that despite what some Western leaders have claimed in the past (George Bush, Tony Blair, etc) democracy is not something that can be installed overnight, especially in a region with such a chaotic history and a complicated political climate as the Middle East. For the sake of the Arab people, lets hope that I’m wrong and that peace and prosperity can return to these lands as soon as possible. 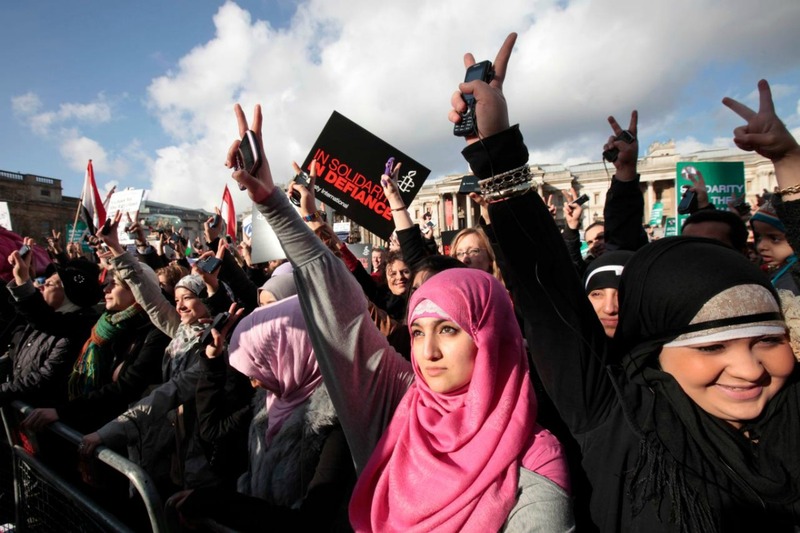 The following link also contains a timeline of significant events regarding the Arab Spring since the start of the movement all the way up till today.